Business planning isn’t just a one-time or annual event. Instead, it’s an ongoing process, where you review your processes and adjust course as needed, while ensuring that you’re staying on track toward your larger goals. Here's how to do this easily with a monthly plan review meeting. 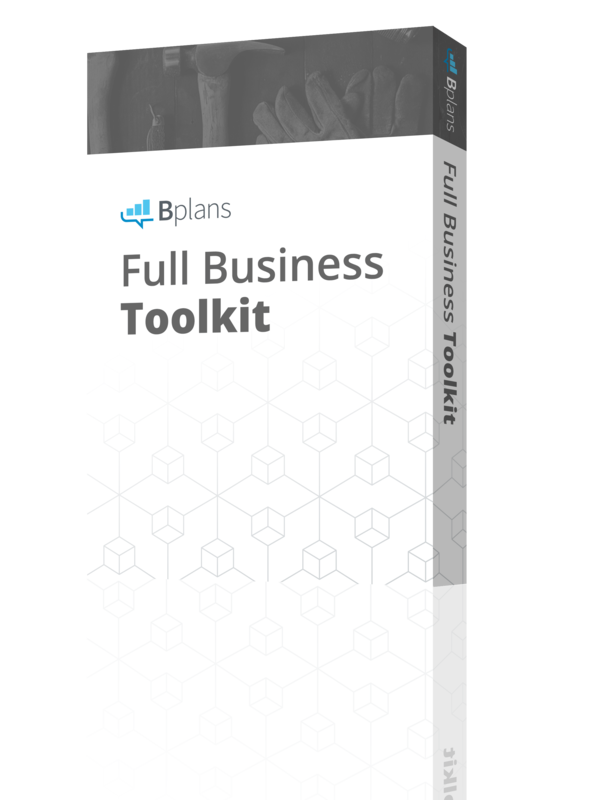 This article, which originally appeared on our LivePlan Blog, is part of our “Business Planning Guide”—a curated list of our articles that will help you with the planning process! There’s tons of advice and information on how to run better meetings and cut down on useless meetings that are making your organization move slower. I absolutely encourage you to be ruthless in your pursuit of fewer and more efficient meetings. But, here at Palo Alto Software, we’ve found one meeting that is simply indispensable. It only takes an hour each month, keeps the management team up to speed on everything that’s going on in the company, and helps us plan and manage in a lean and effective way. This meeting is our monthly plan review meeting. The meeting has been a fixture of our management strategy for years and is simply one of the most effective ways for us to continue to grow the company and adjust our course as necessary. For us, business planning isn’t just a one-time or annual event. Instead, it’s an ongoing process where we are constantly reviewing our process and adjusting course as necessary while ensuring that we’re staying on track toward our larger goals. We treat planning not as a document, but as a management tool that helps guide decisions and strategy. Here’s a quick overview of how we structure our monthly plan review meetings and what’s worked for us over the years. We always start with the numbers first. How did we do last month compared to our forecast? How did we do compared to the same month last year? What does our year-to-date performance look like? We always spend time drilling into the numbers, beyond the top-line revenue and expenses to better understand what the drivers were behind our performance. Did all product lines perform well? Or did some underperform? Did we spend as planned or were there some areas that we overspent in? Most importantly, we review our cash position and cash flow. Did we collect money as planned? What does our cash flow forecast look like for the next few months? While financial reports can be reviewed outside of a meeting, reviewing them together as a team encourages questions and discussion around our revenue and spending. 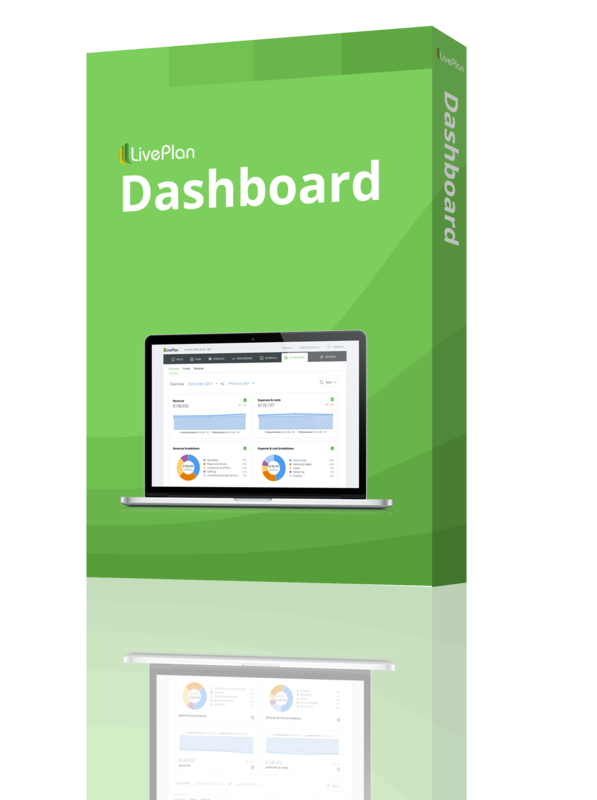 Of course, we use LivePlan to review our numbers because it’s much easier than drilling through exported reports from QuickBooks. But you can always start out with a simple cash flow template in Excel. 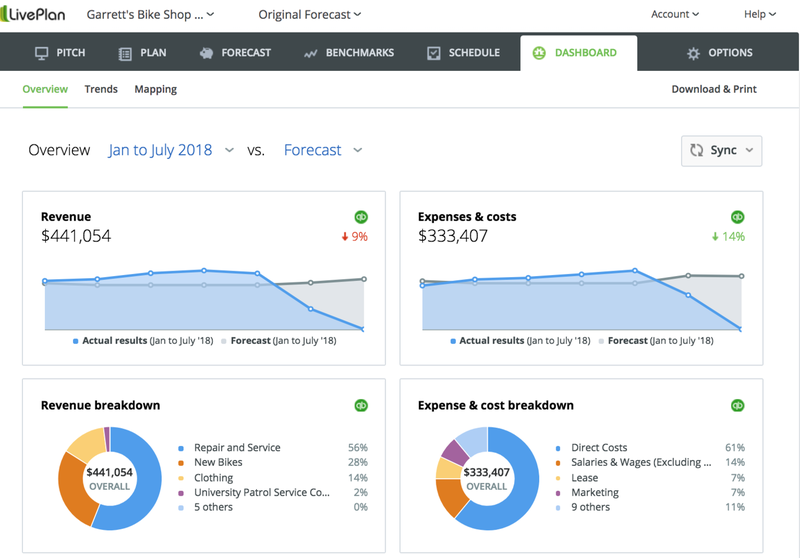 A snapshot of the Dashboard in LivePlan—revenue and expenses for Garrett’s Bike Shop. Once we review our financial performance, we review our “major milestones”—the big tasks we had hoped to get done in the past month and our plans for the next month. We discuss how various teams might be working with each other on different projects and talk about the specific milestones that we have planned. Are these still the tactics that we want to work on that will help achieve our goals? Do we need to shift priorities? Is there new learning and information that would have us change our schedule? By reviewing major initiatives on a monthly basis, we can stay agile and make changes as needed. As we learn more about our customers and our market, we might shift strategies and develop new milestones. Next, we review our long-range strategic goals. While this doesn’t change too often in our situation as an established company, new startups might shift their strategy frequently as they search for a business model that works. For those early-stage startups, this step of the meeting may be the most important step and take the longest. For more established companies, this part of the meeting might typically only take a few minutes. Instead of delving deep into a 40-page business plan document to review our strategy, we review our lean plan, or our one-page business plan (in LivePlan, it’s called the Pitch). It covers our company identity, the core problem we solve for our customers, our solution, competition, and sales and marketing strategy. It’s all on one page so it’s easy to read, review, and change quickly. 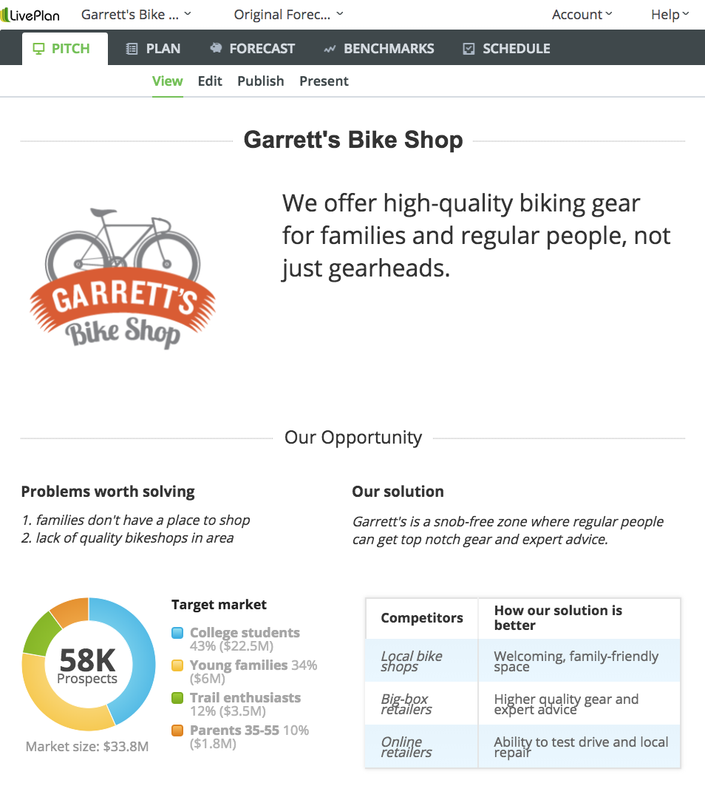 A sample LivePlan Pitch page for Garrett’s Bike Shop. Finally, anyone on the team can bring forward any issues that they want to discuss. This could include new opportunities to consider, prioritization of product features, potential partnerships, or internal HR issues. Everything is fair game and we try to come up with resolutions and next steps for any issue that’s brought up. We’ve found that this type of open-ended discussion really helps generate new ideas and brings different perspectives from managers of different teams. 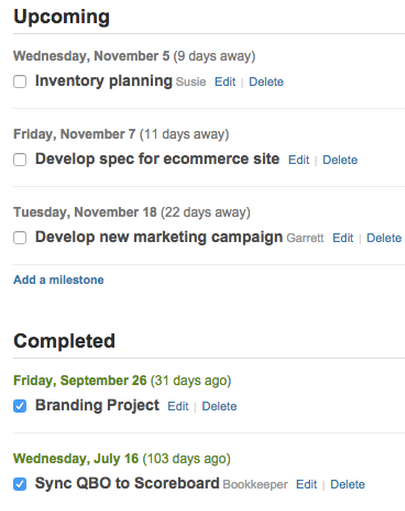 I believe that all companies would benefit from a monthly review of their business. These types of meetings keep everyone on the same page, help share information about progress, and turn planning into a tool that helps teams make informed decisions. It’s important to make it a formal event that’s on the schedule. It can’t be optional and it has to be at a regular time so that everyone always knows when the meeting is. For us, we started out with the meeting on the 3rd Thursday of every month. As our bookkeeping and accounting processes have become more efficient, we’ve been able to move our meeting to the 2nd Friday of the month. While different topics will come up for discussion, it’s important that your plan review meeting has a repeatable agenda. That means making sure that you have your numbers ready for review and that your team has updates on their goals. These plan review meetings aren’t just about staying the course and blindly following the plan. Instead, they are about adjusting the plan. Perhaps you’ll discover that you should be investing more in marketing, or that you’re going to be able to expand and hire faster than you originally planned. The plan review meeting is about making adjustments to your goals and strategies based on what you’ve discovered in the past month. Are there systems and processes that have worked for you in your business to help you implement your strategy and track your performance? Reach out to us on Twitter @Bplans and let us know.